I used to roam greeting card stores and think “I could do that”. I love the messages, sweet poems and clever puns on them. I think it might be where my love of design and typography came from. I would spend tons of money on a bunch of cards that just caught my eye… and I often didn’t even have a recipient in mind. I’d just keep them to pull from when an occassion came up or if I needed to send a thank you or something. But started playing with making my own cards and bought a bunch of blank ones at Michael’s on clearance ages ago. They have lasted me a long time. Recently O started to show interest in coloring. 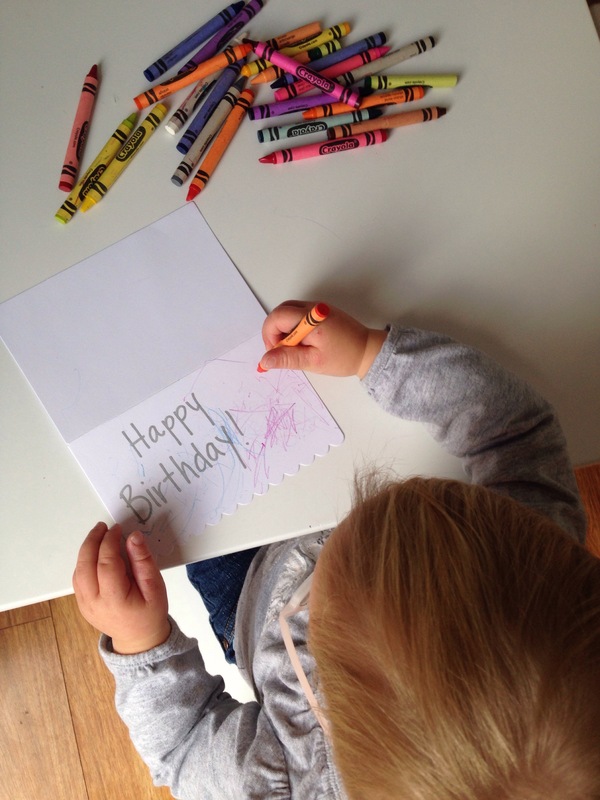 And of course feed her interest with coloring books, crayons, an easel and such. I think I can handle having a little artist on my hands. When we were invited to a birthday party I realized O could make the card! 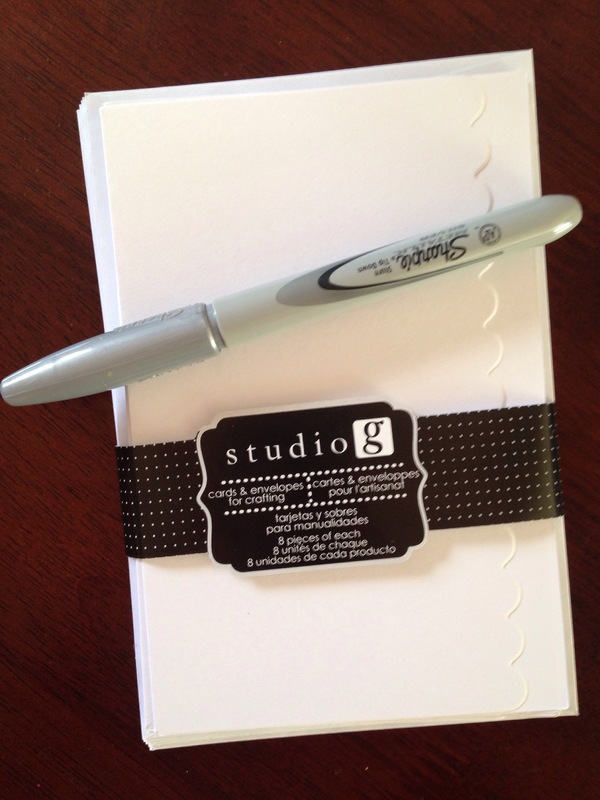 I just used my blank cards and a silver marker to write “Happy Birthday”. I knew crayon wouldn’t conceal the silver marker but I think black or another color could work as well. 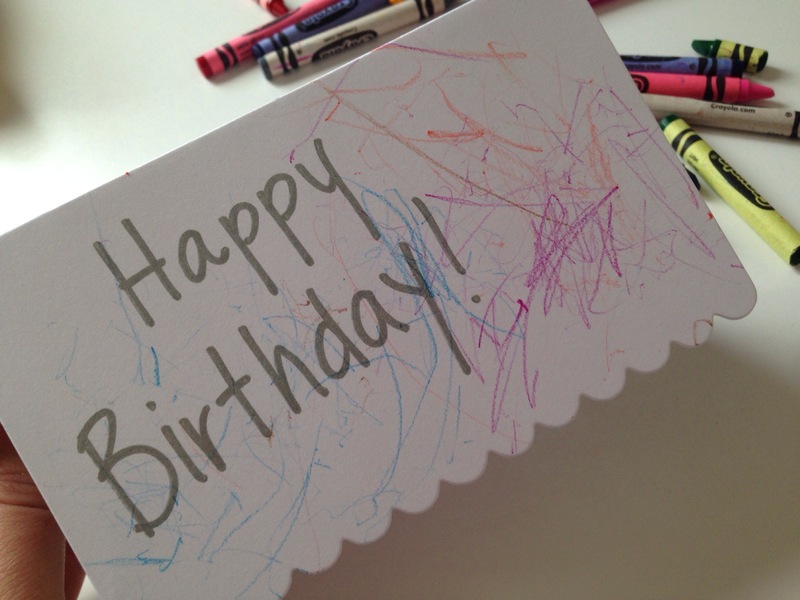 I gave O some crayons and let her loose on the card. Coloring is a really good exercise for when she is patching. While patching, it is best if she focusses and follows things that are close to her (since she is farsighted). Anyway, she obviously loved coloring. She hasn’t yet chosen a dominate hand to use. Can you tell? 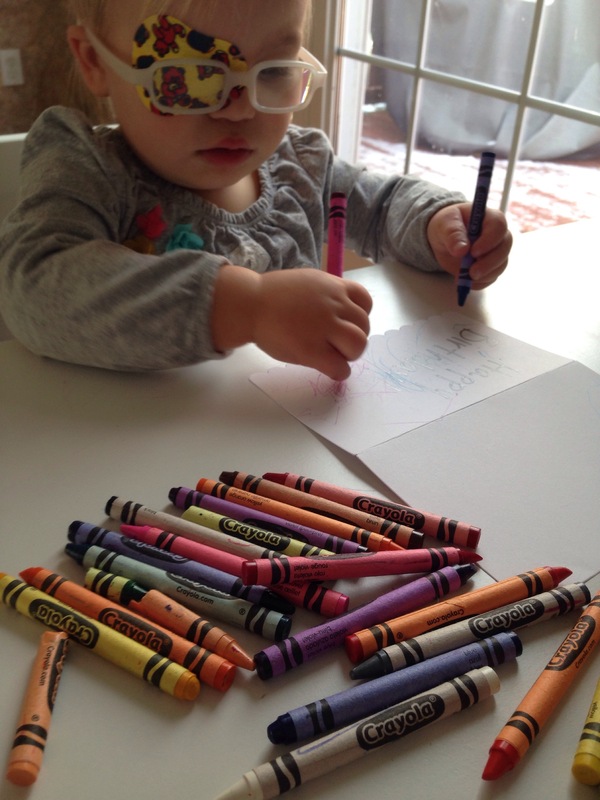 Her current style is just hashing the paper over and over with the crayon. She hasn’t become interested in making shapes or anything but she loves all the colors. And I think orange might be the favorite. And no, I’m never letting her paint her room orange like my mom let me because I had to paint over it and it was torture. This kept her busy for about 20 minutes which impressed me. She was having so much fun that it I let her do a Thanksgiving card for my Grandma. I traced her hand and made a little turkey and then she colored all over… I wish I had gotten a picture of it. When she was finished we had a homemade birthday card for her friend Riley who was turning 6 that weekend. She too is a little artist and I had a blast shopping for her gift with O. We got her practically one of everything from the Crayola section at Target…..everything I would have wanted as a 6 year old artist. Riley squealed when she opened the pad of art paper. Her mom chuckled at how much joy she got from paper… but I remember being thrilled to use real art paper rather than the stuff I stole out of my dad’s giant laser printer at his office. Riley and I are a lot alike. So there you have it. A simple homemade card with a little more meaning. It doesn’t hurt that it entertained my toddler for so long AND it was during patch time. O had another appointment at her Pediatric Ophthalmologist to check up on how her glasses are working for her. 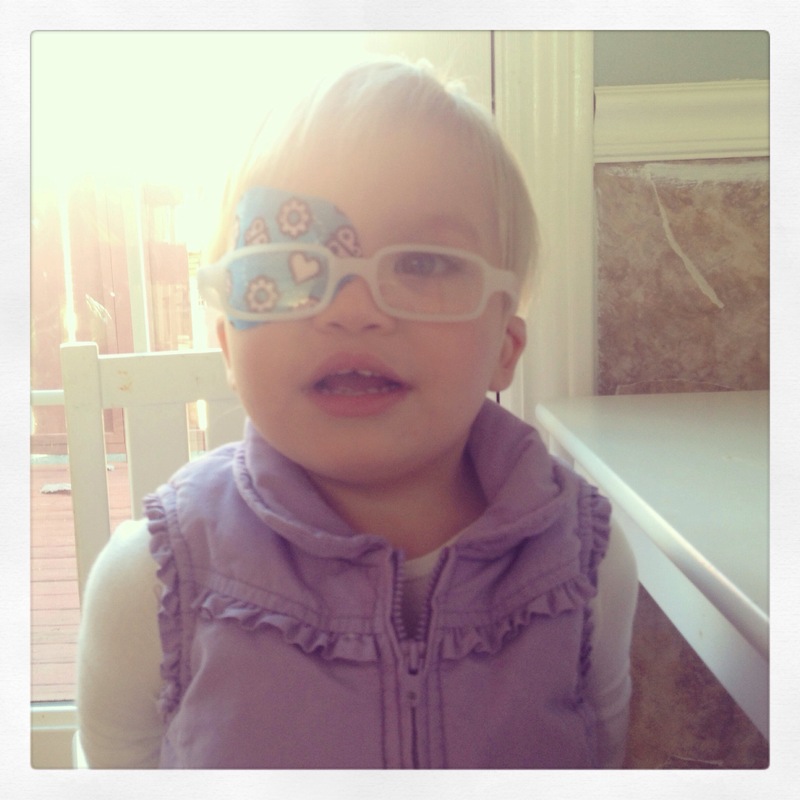 You can read my post about O, her condition and our experiences in Pediatric Opthalmology here. The doctor was impressed with how well she has adjusted to her glasses and even more impressed with how much she embraces her “dasses” as she calls them. Not only does she leave them on, but she will adjust them for comfort or wiggle them on her face to be funny. My favorite part of the appointment was when the doctor was using a light to guide her eyes in different directions and O was opening her mouth saying “Ahhh!”. She went to the dentist with me the other day and the hygienist had her sit and watch my cleaning while she explained each step so that next time O can have a smooth first dentist visit. At the dentist’s visit, we taught her to open her mouth wide and say “Ahhh”… so she obviously was paying attention. Too bad she applied it at the wrong doctor’s office but it made me laugh! The results of the visit were fairly simple. First, her glasses are working well for her. She seems comfortable with them and the prescription seems right. Also, her left eye is responding to the prescription (meaning its not crossing as much when she is wearing her glasses). Second, there is room for improvement. Her left eye is the weak eye (with the +4.50 prescription and the esotropia/crossing) and could still use some strengthening. So the doctor wants her to “patch” for 4 hours a day until our next appointment in March. Patching means she will have her strong eye (in her case the right eye) covered with either a cloth patch over the glasses or a sticky band-aid style patch directly over the eye. Covering the strong eye will give the weak eye (her left) an opportunity to strengthen itself and encourage the brain to utilize the weaker left eye. Fortunately, O has been cooperative wearing the patch. Although we’ve only done it twice so far, she hasn’t attempted to rip it off. The first time I put it on her I tried to make it fun. She likes to play with my make up brushes so while we were playing with the brushes and tickling each others cheeks, I took out the sticky patch and presented it to her. I put it on over her eye while we were looking in the mirror. I let her touch it and fiddle with it for a moment and then I slipped her glasses on so she could see herself in the mirror. Her response was “Oh, woo woo!” which in our house means “So pretty!” …For me I felt like that was a success. She was physically comfortable AND she felt like she looked pretty. Don’t get me wrong, her being pretty isn’t what is important. What is important is that she didn’t feel like she looks different than her usual self or funny. It doesn’t hurt that the sticky patches are printed with fun designs so it’s like a pretty new shirt for her. You can see an example in the photo above. I did give a feeble attempt to have her try the fabric patch over the glasses but she repeatedly just tore her glasses off. To me, thats a fail. It seemed easier to get her used to the patch and then put the glasses on over it. I also think that the sticky patch is less irritating because it stays still on the face, whereas the fabric one moves a little as she smiles, talks and plays so she feels it against her skin more. Overall things are going well for her and I’ve been told by several professionals and friends who have had similar experiences that realizing her condition so early and treating at such young age is a huge advantage. And here I am. With a toddler in glasses. New questions have arisen. And again, all with good intention. O can’t exactly answer them except to point her her glasses and say “dasses” so I politely field the questions. To be clear, these questions aren’t offensive or bothersome. But my repeating the same reel of information kind of is bothersome… Especially if I’m just trying to pick up milk at the store. Like I’m already squeezing that into my day. I wish I had more time to answer your questions but I. Just. Need. Milk. This is really only annoying to me though. So instead of being irritated I’m taking a route that I’m going to call “Advocacy”. I’m not a doctor, nurse or any sort of expert. I’m a parent. But I’m empowered with lots of information and experiences that others are curious about. I plan on answering every question to the best of my knowledge and directing other parents in ways I’ve found helpful myself. But I am only familiar with my own daughter’s condition (farsighted with accommodative esotropia) and I’m not a doctor so don’t be diagnosing your kid based on some crazy lady’s blog post. Especially when said crazy lady usually posts about her love for paint colors. Why am I posting this then? Well for starters this is sort of my therapy. I’ll admit this process has been a bit stressful (especially the beginning) so typing it out and sharing our story is helpful. Also, in my research I found lots of explanation from doctors, medical organizations and so on but I couldn’t find many accounts directly from parents. 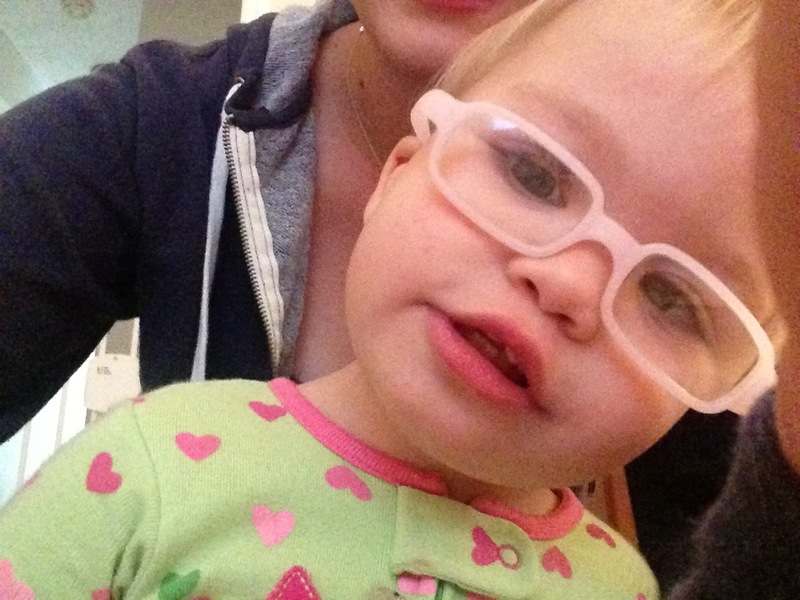 So maybe someone else can stumble upon this in their google search of “toddlers with glasses”. It takes a village and so I share. How did you know she needs glasses? Short answer- We didn’t. Long answer- All babies are born farsighted (can see well far but poorly near) and can only see in black and white for a period as well. Over time the farsightedness becomes less and less. During the process some kids may exhibit eye crossing. O did this in pictures or when we got close to her face. I thought she was learning to focus when this happened. It’s normal until about 12-18 months. By then kids should have mostly outgrown it. Our pediatrician was on the ball and monitoring her crossing since it still seemed to be pretty frequent. But when they haven’t outgrown it then its time to see a Pediatric Ophthalmologist. So we did. What is the exam like? How can they tell what she can and can’t see at such a young age? Children’s exams vary based on their age. Older kids (3?) maybe have to tell what shape, or animal they see. But for O (20 months) she can’t tell us much. So the exam consists of the staff (the doctor and up to two nurses) getting her to focus on something in the distance. Our office has a stuffed dog at the corner of the room that barks when they flip a switch. While she is looking at that the doctor is shining lights in her eyes and studying her. She gets dilation gel from the pharmacy that we have to give her twice a day for a few days before the appointment since kids usually cry out the drops. Then I have to hold her on my lap with her arms up against her ears so that her head is almost “locked” in between her arms. Then Hubby holds her legs from kicking or flipping herself over. And the nurse reclines the chair (like at the dentist) to be completely parallel with the floor. She holds O’s eyes open while the doc stands over us trying to look into her eyes with different lenses shouting out numbers to another nurse over O’s cries. The staff is professional, patient and comforting. Still, she hates it. As a parent it’s torture. I takes everything in me not to cry. But I’m doing this for her. The big picture wins. What is her vision issue/prescription? What does that mean? She is farsighted with accommodative esotropia. Google that and you’ll find that it means she sees well at a distance but her vision close up is poor. She sees a Monet painting everywhere she goes. The accommodative esotropia part means that her brain recognizes that her eye (in this case her left eye has the worse farsightedness) is giving bad information. The left eye sees worse close up so if O is working on a puzzle, looking at a book or looking at her lunch plate that’s when her eye gives the bad information. The brain “turns off” her left eye (to “accommodate” her good vision coming from the right eye) when it gives bad information. When it turns the eye off the muscle that keeps the eye straight relaxes and it causes her eye to cross or turn inward toward her nose. See the pic at the top of this post? Her left eye is turned in. Over time that muscle becomes weak from not being used as much and crossing continues or in some cases becomes worse or even lazy (Amblyopia). Her prescription is +4.50 in the left eye and +4.00 in the right. This is a view through her glasses. 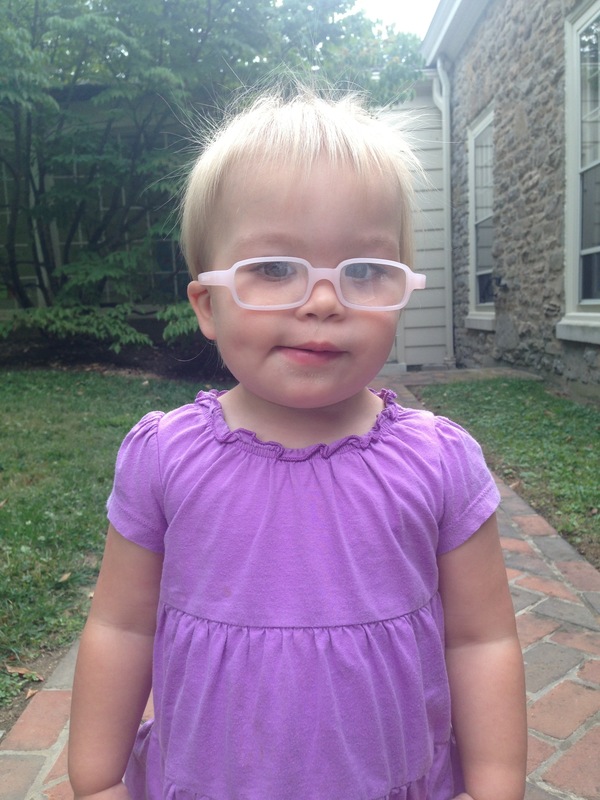 Will the glasses fix her accommodative esotropia? Hopefully. The idea is that if we can get the “bad” (left) eye to give good information by having a prescription to help her see better then the brain won’t turn the eye off. And if the brain doesn’t turn the eye off then the muscle will be used more and become stronger. So we if we fix the farsightedness we can fix the accommodative esotropia (crossing) and prevent amblyopia (lazy eye). If the glasses don’t do the trick then patching is an option. Patching the right eye (her stronger eye) will strengthen the left eye muscles so her eye can see better and be straight when doing so. How can you tell if they are really helping her or working? On the first day I noticed O looking longer at books, differently at the dog and finishing puzzles that she used to dismantle and never attempt to put together. We Facetimed Hubby at work, something we have done many times before. But this time I noticed O making faces in the camera. It had never occurred to me that she had never been able to see herself! She is less clumsy, more confident on steps. She used to tap her foot to find the edge of a step before lowering herself down the step. Now she does steps like a pro. She is interested in things she never cared for before like the iPad, tv, the alphabet. The kid can see better by all accounts. Imagine the whole world she is seeing now compared to what she used to see. We are literally changing our kid’s world. In the long run we will know of they are really working if her left eye stops crossing in. If not we will begin to patch. What does it mean to patch ? Patching is when one eye is covered either with a fabric patch over the glasses or a sticky bandaid type patch directly on the face over the eye. The strong eye is patched to give the weaker eye an opportunity to strengthen itself. When will you know if the glasses are enough or when it’s time to patch? Every kid is different. We made an appointment to return to the Pediatric Ophthalmologist in 3 months. We will do whatever he advises based on that exam. What if the patch doesn’t help? Surgery is an option. I don’t know very much about that yet because we aren’t there. Hubby had the same thing when he was little and did have the surgery with huge success. Actually his ophthalmologist is also O’s doctor all these years later. He might just know what he’s doing. Good one. I had to learn that one myself! An optometrist can help you get a prescription, check for common vision issues and conditions. They hold a Doctor of Optometry degree and are licensed and credentialed. Ophthalmologists are medical doctors (with M.D.s and often other letters after their names) who can do everything optometrists do as well as perform surgery, Lasik, help with eye and muscle development/therapy and so on. Read more here. Is she supposed to wear them all day long? Yes. If her eyes are open the she should be wearing them. She should only take them off for nap, bath and bed. Does she keep them on? How do you get her to keep them on? Once we got the right fit for her little face she started keeping them on pretty well. 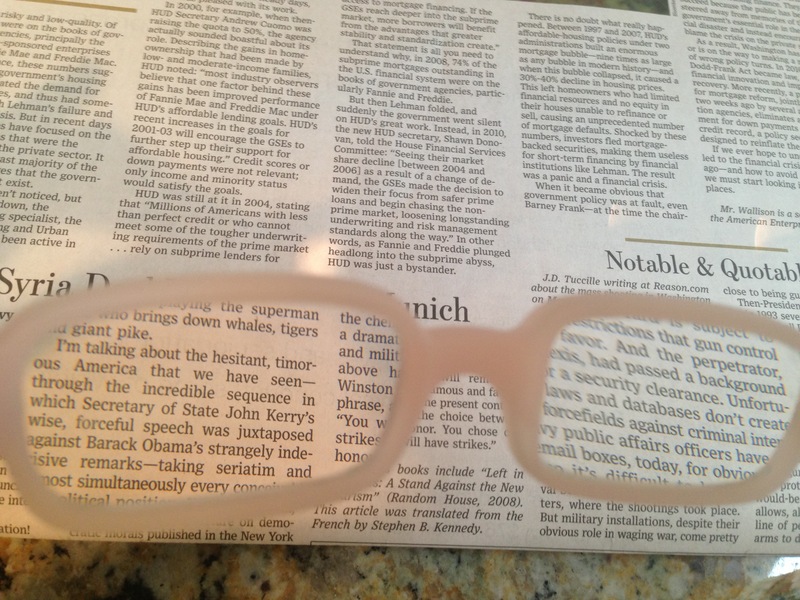 Most kids realize how much better they can see with glasses and so they leave them on out of necessity. Occasionally if the glasses get jumbled (from a fall for example) she will jut take them off since she can’t quite fix them herself. She also takes them off in a fit just as another kid might kick or throw something. But for the most part they stay on all day. As for getting the right fit for her little head it wasn’t easy. O is petite to begin with… she measures at 20% in head circumference at her check ups. 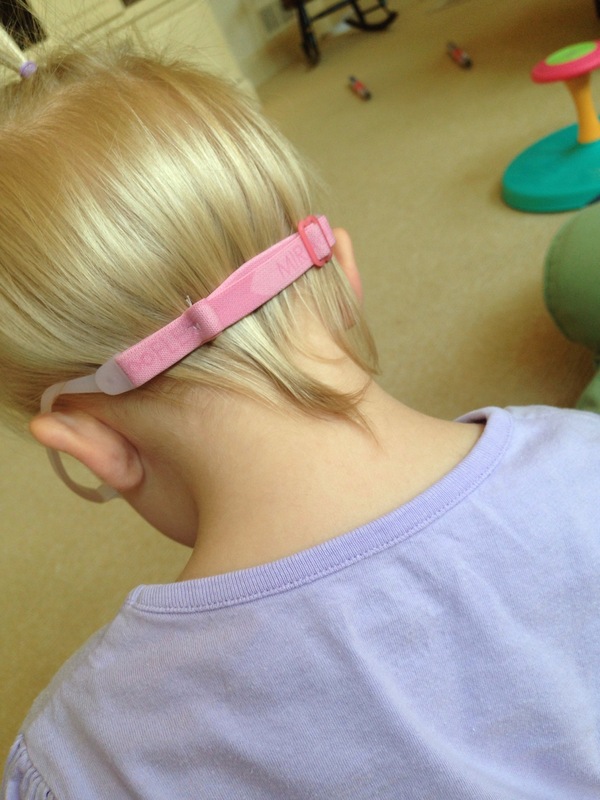 We got her rectangular Miraflex brand glasses that come with an elastic band to go around the back of the head. It took a few tries but I stitched a few stitches into the band to make it fit more snug. That way the glasses stayed up on her face since she’s so small that her nose doesn’t even have a bridge to hold up glasses. Since they don’t slide and are now more comfortable she keeps them on. How long will she have to wear glasses? Her whole life or just through school? Again, every kid is different. She will be wearing these for at least a few years. We will have to get new frames and probably update the prescription. But she will need glasses for a while. Maybe for everything always or maybe just for visually strenuous tasks (like computers). We will know more as time goes on. My kid has never had an exam when should we start that? Actually, your kid probably has been examined. Pediatricians conduct basic eye exams at every check up. For smaller kids they look into the eyes with lights or ask them to follow a finger while they move it. Older kids might have to identify shapes or letters at a distance. Although most Pediatricians do this, its not an actual vision exam. They are usually looking for obvious abnormalities and issues. I have just learned that children should be seen by an Optometrist as early as 6 months old. I don’t recall that being in any of my baby-prep books, nor do I recall my Pediatrician reminding me to do so (as he has already for dental visits). Some preschools and kindergartens do similar exams (and audiology exams too) and are looking for red flags. If you have a concern ask your pediatrician for an exam or a referral. Red flags to look for could be strain, headaches, claiming eyes are tired or hurting, obvious improper identification of letters or shapes, stumbling or tripping, uncoordinated steps. At any rate, it doesn’t hurt to ask and early detection is always good. Thanks for reading my novel. And for “listening”. 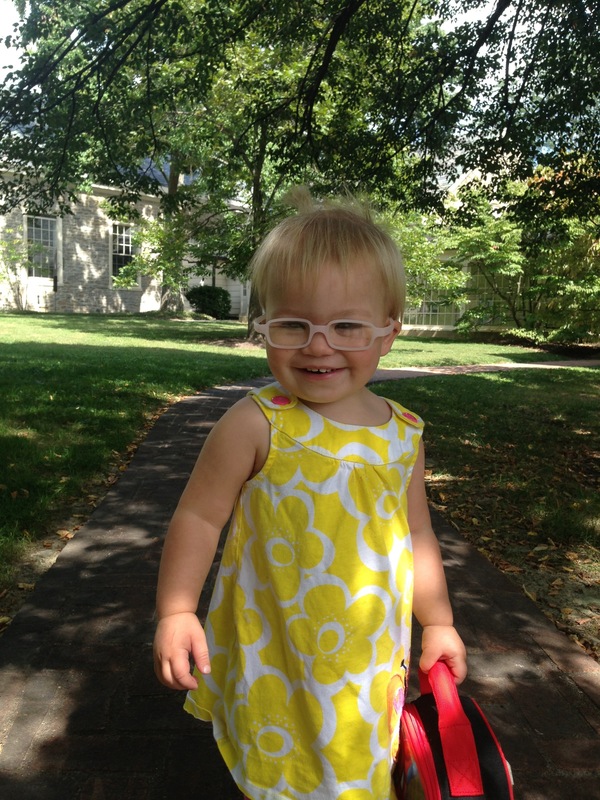 I’ll probably be posting regularly about O’s glasses, progress and all around adorableness. For now O doesn’t seem to mind the glasses or the attention they bring her. Today we took the boys to the dentist and the entire staff poured over her while the boys got cleanings. She ate it all up. Can you handle this cuteness?!?!?? ?